Kanton Atoll has the largest most accessible lagoon of all the islands in the Phoenix Islands Protected Area. Jim Maragos and Paul Jokiel first described the extensive community of plating Acropora corals at the mouth end of the lagoon in 1978. 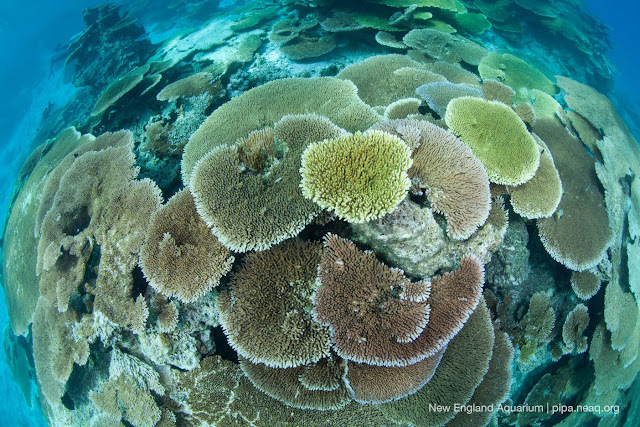 Just over two decades later, scientists with the New England Aquarium documented again a thriving community at the mouth dominated by plating corals that rose to the surface like castles under the sea. I remember vividly how these cascading corals supported abundant fish life, providing shelter and protection from the ocean swell. One of my favorite things was to lie on the sandy bottom and look under the coral plates, as I would inevitably see a large grouper staring back at me. I would turn my head to look up and see parrotfish and surgeonfish swimming above my head and between the corals and brightly colored butterflyfish feeding. Then in 2003, the Phoenix Islands suffered a mass coral bleaching event. Dr. David Obura and I surveyed the reefs in 2005 and were heartbroken to see and document near 100% mortality of those corals. At that moment, it really hit home that climate change had the potential to impact any reef, causing mass losses of coral. Nowhere was safe, even in the remote regions of the world. For places like the Phoenix Islands, we did not know how quickly they would recover, given their remote location in the central Pacific. 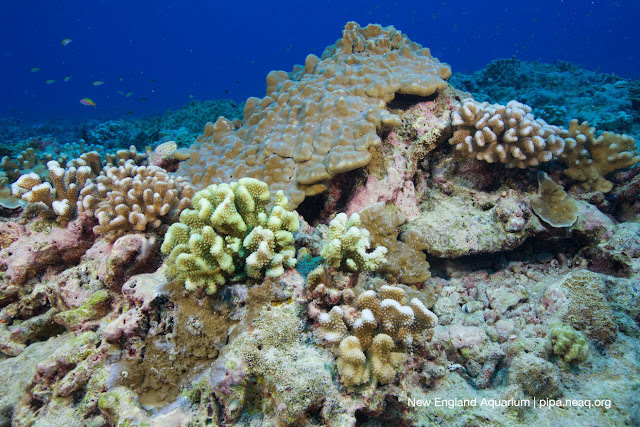 Return visits in 2009 and 2012 showed very little recovery, and I was starting to give up hope that the coral community in Kanton lagoon would return. So imagine my surprise, shock and utter joy to jump into the water, expect to see a ghost of a reef, and to be met with some of the most rapid recovery I have witnessed as a scientist. In the three years since I was last in Kanton lagoon, there has been a massive pulse in recruitment. 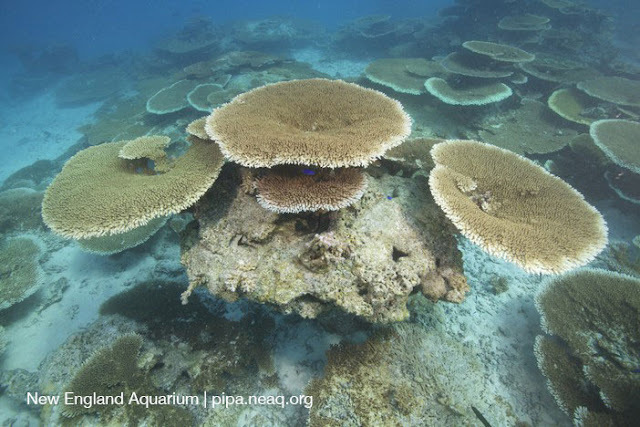 Plating Acropora corals have settled on the dead skeletons, and have grown out in radial directions, almost completely covering them. All around me are again live coral castles reaching up from the bottom to within a meter of the surface. 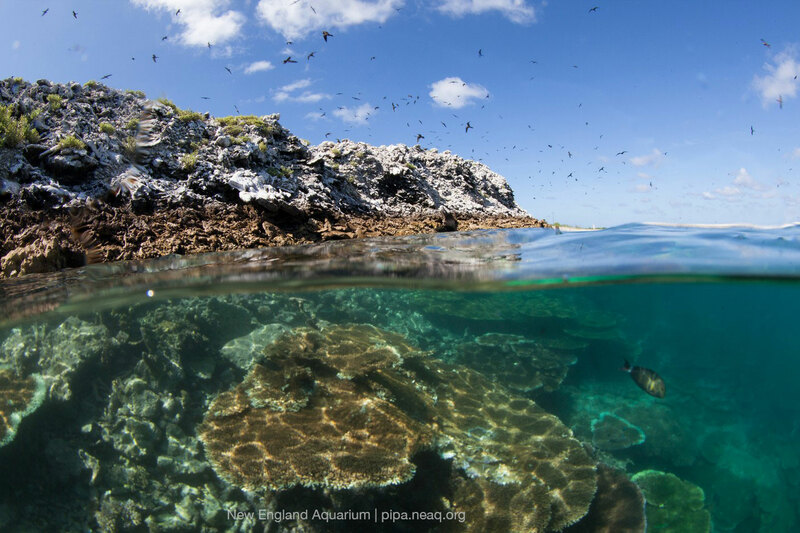 And with a returning thriving coral community, the fish have now returned again in numbers, leaving me with hope that the Phoenix Islands will rise from the ashes and return to their former glory.